Microvisions, for the past 7 years, has been a great way for the Society of Illustrators to raise funds for the student scholarship. Each year, Irene Gallo, Gregory Manchess, and Dan Dos Santos choose illustrators to create 5 x 7 mini artworks to be auctioned off for the SOI. This year, Scott Brundage was among the artists chosen (the line-up that includes Julie Bell, Peter De Seve, and Brian Despain, see the full list here). 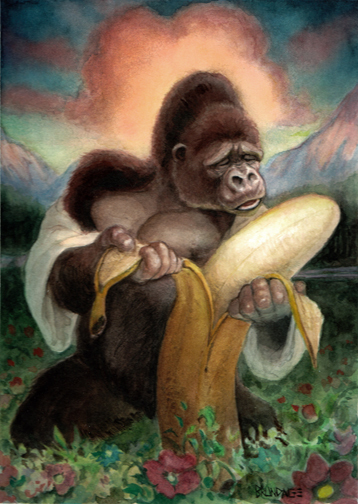 Scott, a rather humorous guy (so the rumors go), created this illustration of gorilla romance, a tale that would grace the covers of Harlequin books in the Planet of the Apes universe.